Thanks to all who entered-this contest is now closed! Do you know that Neoprene- that black stretchy material that goes into wetsuits, laptop sleeves, and knee braces, and which encases much of the gear we use to carry our electronics, water bottles, and lunch bags- is quite toxic? Thanks to GreenSmart there is a non toxic alternative-Neogreene. Before I was contacted by GreenSmart I had no idea that neoprene was full of toxic nastiness- most toxic are the solvents used to glue it to other materials. And that neoprene smell is offgassing VOCs. Formaldehyde, lead, toluene and chlorine are all used with neoprene. The people at GreenSmart were determined to find a cleaner, greener alternative. Patagonia created a neoprene alternative that was based on limestone rather than petroleum but it still requires chemical solvents to bond to other material. Neogreene is a result of a long, careful collaboration with GreenSmart’s supplier, and is a vast improvement on conventional neoprene materials. 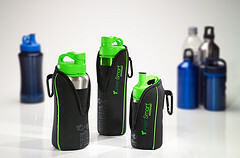 The first products to be made with Neogreene are laptop sleeves and water bottle totes/holsters. I had the chance to check out a laptop sleeve and I am impressed. Very high quality, same durability- but with no neoprene smell and I know it’s eco. The first thing you might notice about these products is that something missing. There’s no cardboard packaging framing the sleeves for store display. Just a small fabric loop at top for it to hang in stores, with a paper tag telling you about it, itself recycled and recyclable. On the outside of the actual products you’ll find something else which is unique: a column of stylized words, describing what is and isn’t inside: No Chlorine. Free of Poisons. People Sensitive. Water-Based. 2x Insulation. GreenSmart realizes there’s still more to be done to eliminate the use of all non renewable resources, using all recycled materials, and they’re committed to continuing towards that goal. Meanwhile they have a few products that are a great start towards achieving that goal. And now you have the opportunity to win those products. 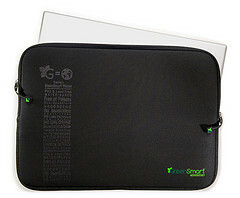 One lucky commenter will receive a laptop sleeve in the size of their choice and a water bottle tote. This is great Back-To-School Giveaway sponsored by GreenSmart and the makers of Neogreene. Please leave a comment and include your contact info. US Shipping only. A winner will be chosen at random on Thursday September 10. I love the idea! I’d love to see them make triathlon wetsuits so I can be green when I race, too! What a great product! Or should I say products? I’m VERY interested in both and will be looking to get them. I already own both of these, and have really enjoyed them, beyond the fact they’re non toxic, they have worked well (I like the perforations in the Neogreene at the bottom of the laptop sleeve, letting my hot laptop cool off quicker) And their style makes them more then just a utilitarian thing. Enjoy, whoever wins these! I had no idea that it was so bad… you learn something new everyday! I’m glad to see that a company is doing something about it! Very cool products, and I look forward to what other products they come up with. Wow, I had no idea! That is awesome that there is a better alternative. Hopefully it will become the standard within a couple of years. Thanks for informing me about Neoprene and giving me a chance to win Neogreene! I’ve held the Neogreene and it felt very similar, alas it wasn’t mine. Would love to see if it works as well. These sound fantastic! I’d love one! I didn’t realize neoprene was toxic, DUH! I should have known that! There are so many things that are toxic and we just don’t think about it. I’m so glad I found your site. I learn something new from you everyday. Thanks for a great non-toxic product! I’m really tired of products with lots of chemicals that off-gas and adversely affect people’s health. It’s great that someone is looking out for the constitution of their products. 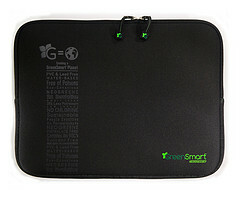 Good stuff GreenSmart! What a great idea. I’d love to try these out. Who knew? Thanks for the info and offer! Wow what a great product. I need a laptop sleeve! I knew it! I own two bottle sleeves made of Neoprene (by BuiltNY), I use one for my baby’s Klean Kanteen bottle, and I always thought they smelled pretty bad. I was thinking about toxic VOCs and almost stopped using them but I told myself I was maybe getting a bit paranoied about toxic products. Now I am definitely going to stop using them!!! Sounds like a fabulous product–thanks! Ooh, thanks for the prize. I’d love to win! Geez…I had no idea. Our seat covers are neoprene, our water bottle covers are neoprene (and I just realized we have the old, bpa sigg bottles)…This has not been a good week for us, we’d love to win! I’m so happy to see a green alternative. Thanks for the contest. I’d love to try these out for myself and I think it’s wonderful that you’re making this giveaway possible. Pick me, pick me! I need something to keep my kleen kanteens from getting dented, and this would be perfect. Lead in neoprene is scary! Green and it looks good, count me in. Jewelry Baby Can Play With: Oh Plah! Who Is the Consumer Product Safety Commission?